Ducie Island, a rarely visited island atoll, has been part of the Pitcairn Islands since 1902, there are no permanent inhabitants, nor is there any scheduled transportation to the island. Ducie is a designated "Protected Marine Area", landing on the island requires permission, payment of a per person fee, and a visa. The land area is 0.7 km². The maximum elevation is 4 m. 70 percent of the land is forested with Tournefortia Argentea (a common tree throughout much of the Pacific Ocean), which grows to a height of 6 m.
Portuguese sailor Pedro Fernandez de Quiros discovered Ducie on January 26, 1606 and named it La Encarnación. It was later rediscovered by the British in 1791 by Captain Edward Edwards who commanded the Pandora while searching for the mutineers from the Bounty. Ducie Island is named after Baron Francis Ducie, a captain in the Royal Navy. The island was claimed in 1867 for the United States under the Guano Islands Act and the UK annexed the island in 1902. 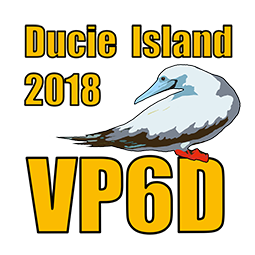 Ducie became a DXCC country on November 16th 2001 and the first expedition was led by Kan, JA1BK in March 2002 using the VP6DI callsign. One year later, in March 2003, Kan again operated with the help of PIARA as VP6DIA from this atoll. The most recent major DX-pedition was VP6DX in 2008.